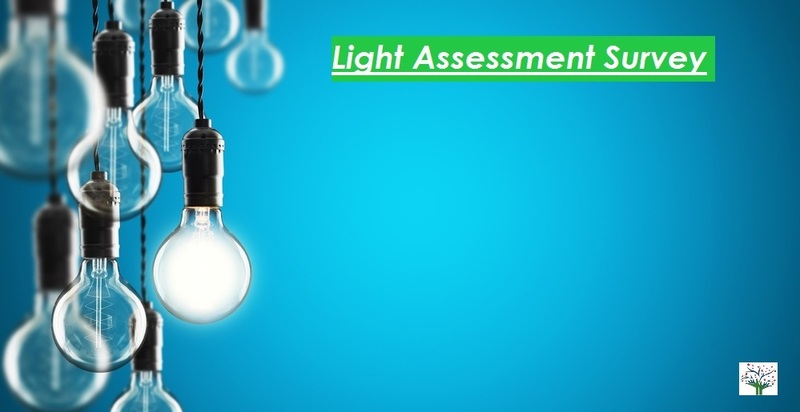 Illumination Survey or Light Assessment or Lux Level survey is conducted to identify Too much bright light, glare, low light or flickering light to avoid potential hazards and evaluation of risk to improve employee safety. Sufficient Lighting has major impact on performance and efficiency of the employees at workplace. It helps them to read labels and safety instructions clearly without any hurdles, to make sure prevention of health hazards of employees. Therefore there should be appropriate light fall on desk or work area of the employees. Too much bright light (High intensity), Strong glare, Low light, or continuous flickering light are unsuitable for workplace. To ensure good lighting the persons who is accountable for workplace should contact environmental consultants to conduct Illumination Survey or else you can do it on your own by using a lux meter. In short purpose to lighting assessment is study of lighting condition in work environment. Illuminance is common parameter while studying Illumination measurement. It defines or measures the amount of light is falling on unit surface area of workplace and its Unit is lux (lx). It is used to evaluate the capability of lighting for seeing an object. Also Read what is Workplace Monitoring procedure? Illuminance is measured by Lux Meter which is small instrument containing sensor and Display parts. Sensor part is placed on a place where Illuminance to be measured and display part shows reading in Lux unit. In general, uniform light is required in workplace to perform particular type of activity. Eg. Office, reception etc. To measure Illuminance environmental consultants can help. To measure Illuminance big area should be divided into small equal parts and which can be in square shape. Then sensor of luxmeter or Monitor lighting kit is kept at the centre of each square. By observing results we can come to know about distribution of light in workplace. Also Average of all these values obtained by this method gives average value of illuminance. In some workplaces some task may demand more intensity or brightness than normal. In these type of conditions a local light is installed in area of that task or near that workstation. To measure Illuminance for a particular task majorly 4 Points are selected on work plane. Their Illuminance is measured for each point in illumination monitoring procedure. Average Illuminance of that task place is calculated by taking average for those 4 values. Below mentioned points to be taken in consideration while measuring Illuminance for a particular task. Illumination at workplace should be taken at work-plane. If there is no work-plane is defined then 3 feet from ground can be considered as work-plane. 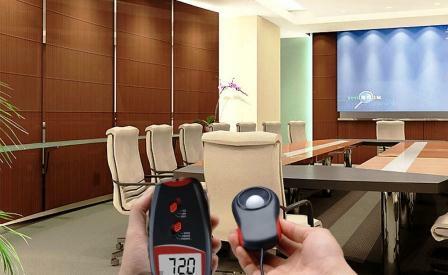 Sensor of luxmeter is to be placed in reading plane where employee do reading tasks. Like desks, or Cupboards (to select books etc.). It means it should be placed horizontally on desk and vertically on cupboard. Also it is important that the person who is measuring Illuminance should not obstruct the normal lighting path. 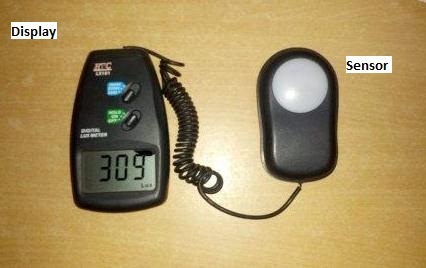 He should move sideways, back or forth to ensure that he/she is not blocking light falling on Sensor of luxmeter. Always select lowest measurement range in luxmeter as it will give more accurate reading. The illumination points should not be too close to obstructions, walls or cupboards. While conducting Illumination survey for artificial light make sure that daylight is blocked by curtains. It will give you more accurate reading. What do you mean by Appropriate Level of Illumination or Lighting? Appropriate level of illumination is the intensity of light which allows you to see what you need to see without any visual discomfort. Illumination is measured in Lux unit. In every factory where natural sun light is not reachable or not uniform then in that case additional uniform lighting should be provided. It should avoid hard shadows, strong contrast, free from direct or reflected glare. Role of adequate lighting at workplace plays vital role in employee safety. Requirement of lighting differs based of type of work & Place. Hence there are two types of lighting requirement based on place and type of work is being carried out. Recommended Lighting Levels by Maharashtra Factory Rules 1963. Illumination Survey or Lighting Assessment is very important factor to find out health hazards, it can give idea what are blind spots in workplace, how to overcome them, where to put light sources to get best out of them etc. If this process followed correctly then it will help to increase efficiency and performance of Employees. We suggest you to that above mentioned concepts are very basic in nature for illumination measurement. An illumination measurement professional may or may not follow these instructions as per his personal judgement or experience. We Perfect Pollucon Services is Environmental consultancy firm and offers services in Illumination Survey and Workplace Monitoring. 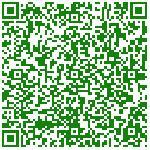 If you want to know more about our services then contact us by filling up Contact us form present on right side.